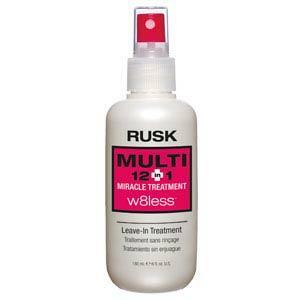 Style Source Magazine | Rusk W8less Multi 12 in 1 Miracle Treatment 6 oz. Home /	Solutions / Damaged/Split Ends / Rusk W8less Multi 12 in 1 Miracle Treatment 6 oz. A Multi 12 in 1 Miracle Treatment. Salon professionals who face a range of hair challenges can reach for this "go-to" solution with confidence. Rusk's custom formulation delivers 12 benefits in one bottle. 6 fl. oz.